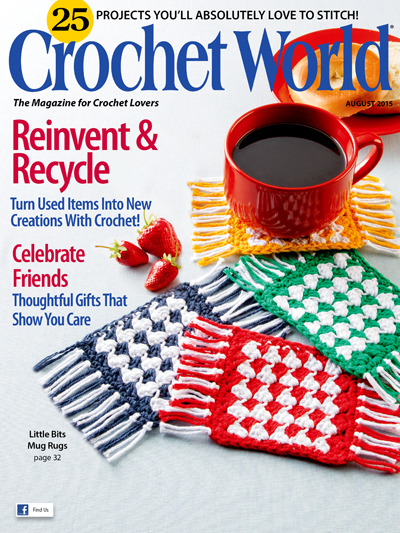 Packed with 25 must-have crochet patterns, this issue is sure to be a hit! Don't miss out on getting instant satisfaction with a download, or you can order a printed copy just as easily! Our Reinvent & Recycle section shows you nifty ways to repurpose used items into clever new designs including a rag rug, place mat, storage tote and pullover top! 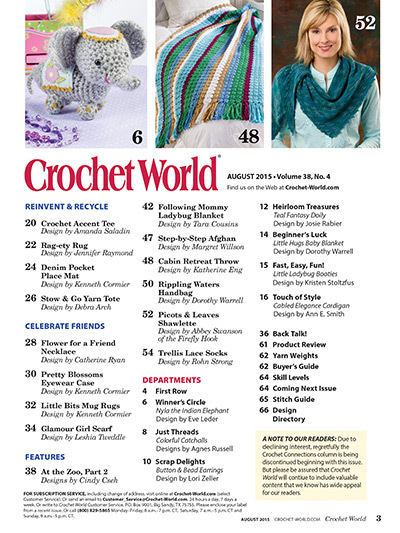 Join us in our celebration of Friendship Day (August 2) by making a variety of thoughtful gifts for those special people in your life, including an eyeglasses case, a floral necklace, a pretty scarf and the vibrant Little Bits Mug Rugs featured on our cover! You'll also get crochet patterns for garments, fashion accessories, afghans and throws, baby items and adorable stuffed animals! Don't wait -- download today!